DC Home and Condo Prices: Home Sales: Anything for less than $500,000? Home Sales: Anything for less than $500,000? 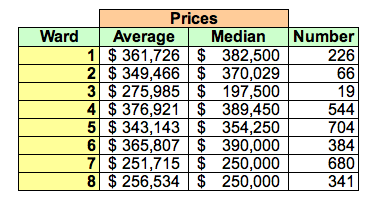 A few weeks ago I posted an analysis of the market for condos costing less than $250,000. 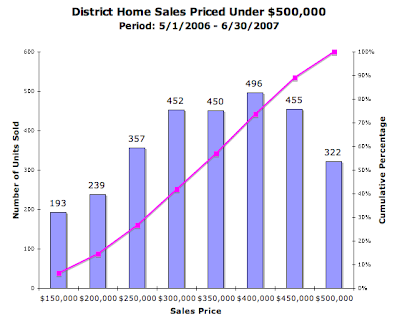 Following up on that, I've just completed a similar analysis of the District's home market. Specifically, can you buy a house in the District for less than $500,000? It's a fair question to ask when the average price of a home sale recorded by the District in June 2007 was $635,385 [my analysis]. In other parts of the country, this is a ridiculous question. When I lived in New Orleans, $500,000 bought a nice very home in Uptown, if not the Garden District. I'm talking the nicest part of the city and, better yet, on "high" ground [maybe 3' above sea level]. You could have called Anne Rice "neighbor", which would have been relatively easy since she owned three homes in the Garden District alone before she abandoned the city for the Northshore [the home on First Street that all the tourists gawked at, her stretch limo parked in front; the party house on St. Charles; and the old St. Elizabeth's orphanage on Napoleon Avenue]; I lived between homes #1 and #2. Rising mortgage defaults have caused Wall Street investors to stop buying many securities backed by home loans, thus shutting off the flow of money that had financed much of the housing boom. Dozens of mortgage lenders and at least two hedge funds have shut down, while companies in other industries have shelved plans to borrow money. Home buyers are finding it virtually impossible to obtain mortgages unless they are willing to document their income, make sizable down payments and demonstrate a history of paying bills on time -- a drastic shift from the looser borrowing rules of recent years. Even borrowers with good credit histories have seen mortgage interest rates jump on "jumbo loans" worth more than $417,000. Such loans were used heavily in the Washington area and other regions where home prices soared during the boom. Wells Fargo made news last week when it hiked interest rates for jumbo loans from 6 7/8% to 8%. Looking at Bankrate.com, a jumbo loan in the District (30 year fixed, $500,000 with 5% down, zero points) will run anywhere from 6.801 - 8.384%. So let's say you want to put 20% down on a house to avoid getting a jumbo loan and you've found a mortgage company that can loan the funds: can you find a house for $500,000 or less to make this work? The preponderance of sales were in NE. No surprise here, Ward's 2 and 3 had the fewest sales. 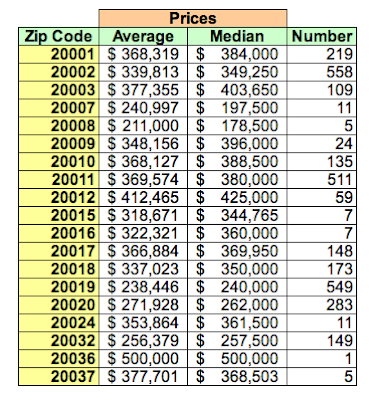 Zip codes 20002, 20011, and 20019 comprised more than half the sales. Amazingly, 20015 and 20016 each had sales of 7 units, much more than I would have expected. It's interesting that in 13 months, not one house in 20005 sold for $500,000 or less. You are great with Data. IN Arlington I found that it went from 24 contracts down to 14 in the over 500k arena; and went from 16 up to 20 contracts in the under $500k arena. If your buying power drops by 10%... you wither don't buy, or you buy less. Love to see your report. Compile it and I'll get you in the WaPo. Ah, I wish I had access to that data, but I'm a simple civilian with no access to MLS [the real MLS, not the MLS you see on realtor.com or homedatabase.com] so I won't be able to parse that one out.